The Domestic water purifier is based on polysulfone type of ultrafiltration membrane in a unique cylindrical configuration to purify the domestic water with respect to microorganism, colour, odour, suspended solids and organics. Very effective as it removes bacteria to the extent of >99.99% (4 log scale). As the device filters out bacteria, no dead bacteria in product water. 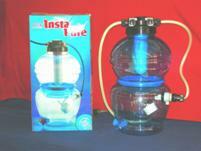 Removes complete turbidity and produces crystal clear water. Work in a dead end device so not a single drop of water is wasted. Does not need electricity or addition of any chemical. Provision to remove organic or colouring material if they are present in feed. Highly strong (both chemically and mechanically) membranes giving high life (3-5 years). Device works between the hydrostatic heads (5 psig to 35 psig) and can produce about 40 litres of pure water per day at about 10 psig head. This technology has been transferred to 18 parties. Various products developed by Entrepreneurs using BARC technology. Due to rapid increase in population in general and urbanisation in particular, over exploitation of good quality water sources and poor water supply system, a large population of developing countries do not have access to good quality potable water and is susceptible to water borne diseases which account to about 90% of our visit to a medical doctor. There are few on line devices in market for purification of domestic water (mostly U.V. treatment type) which are not only expensive but needs frequent maintenance/replacement. 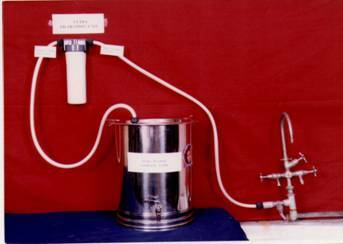 The “on-line domestic water purification device” is based on polysulfone type of ultrafiltration membrane in a unique cylindrical configuration. Almost maintenance free except occasional cleaning of suspended solids which deposits on membrane surface and this does not take more than 3-4 minutes time. To purify the domestic water with respect to microorganism, colour, odour, suspended solids and organics. Briefly, the process involves preparation of a membrane casting solution consisting of basic polymer, selected additive and solvent, and then coating of a polymeric film from this solution on a porous support by phase inversion process. Rest of the things are simple assembly of this membrane filter in appropriate housing etc. All the raw materials like polysulfone polymers, additives and solvents are produced within the country and are available in local market. A small room with window air-conditioner/dehumidifier is needed to coat ultrafiltration membrane unit. 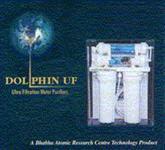 All the steps in the presented technology are manual in nature and hence does not require electrical power for process. Constant source of water is needed to produce and test the membrane device. One Chemist and one technician to observe the process and two skilled workers would be adequate to produce about 25 water purifiers per day.